Propellerhead Reason is a favorite DAW among producers and sound designers, regarded for its straightforward workflow and the ease with which you can craft new sounds from its own unique software instruments or your own sample library. The rack-focused production software lets you build a virtual "rack" of instruments to fill out your tracks, combining its synths, drum machines, and other tools in an easy-to-use interface. 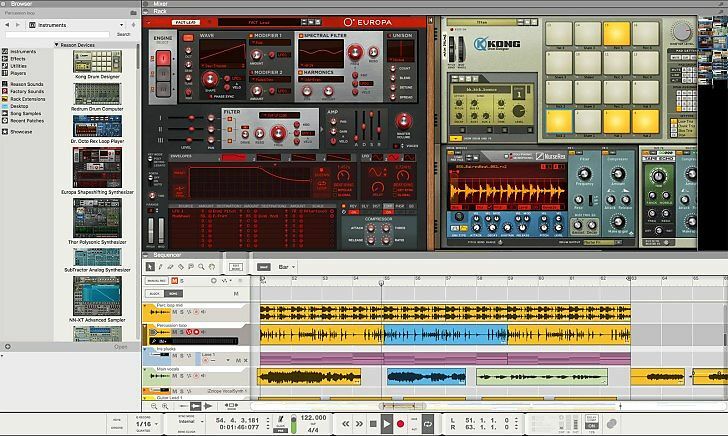 With today’s release of Reason Intro, Propellerhead is offering an affordable, feature-rich entrance into its music software line. Until now, many users who were interested Reason 10 but unsure if they’d like the full program could buy Reason Essentials—a stripped-down version of the software that doesn’t include many of the company’s trademark synths, loop libraries, and effects. Reason Intro not only replaces the Essentials, but greatly expands the amount of tools included. For $99 USD, Reason Intro includes 16 tracks of audio and MIDI recording, 10 instruments (including the popular Europa Synthesizer), 11 effects, and a 3.7 gigabyte sound library. Unlike older versions of Reason, Intro also supports VST & Rack extension plugins. Intro owners will also have the option to upgrade to the full Reason 10 at a discounted price.